Asma Ali is a Manager of Network Development with Duke Corporate Education. In this role, she is responsible for maintaining relationships with educators in the global network. 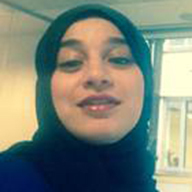 Asma joined Duke CE in 2006 to support managing directors in the London office. Prior to joining Duke CE, she worked as an Administrative Officer for the Membership Department at the Chartered Institute of Linguist, based at London Bridge. She was responsible for more than 6,000 current members and inclusion on the Find-a-Linguist online database, which increased by almost 50 percent in the time Asma was there. She also assisted exhibiting for the Institute at language events and exhibitions. Asma worked for Barclays Bank Plc whilst studying for her BA Degree in Business Management and Finance at the University of Westminster, London, which she completed in 2003. She is bilingual in English and Guajarati and speaks Urdu, too.